The crowdfunding campaign has been successful! Rainforest Concern raised £8790 of the £7,000 target with 71 backers in 56 days. Thank you from everyone who has supported our Gardening back the biosphere. Now we can get stuck into working to protect the fragile ecosystem in this corner of the Western Ghats. And as if in celebration, the Titan Arum at the sanctuary decided to bloom late this July for the first time in its nine year life. Classified as ‘Vulnerable’ on the IUCN Red List, this species has the world’s largest inflorescence, as well as being one of the smelliest flowering plants! It is also known as the ‘Corpse Flower’ because of the strong and unpleasant stench it gives off to attract carcass eating insects to pollinate it. 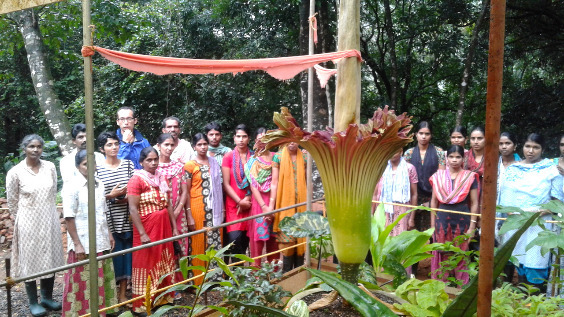 And its attracted more than insects, many visitors have come to the sanctuary to marvel at this rare flower.